Come for the cider. BEST VIEW. BEST VIBE. L BEST VIEW. BEST VIBE. Stay for the view. BEST TASTES. INK · CUR BEST TASTES. BEST VIEW. BEST VIBE. BEST TASTES. At the Old Schoolhouse in Maple City! Family Friendly Local Focus Fare serving Grass-fed Burgers and Sicilian-Style Pizza. "AS A TEENAGE VACATIONER, NORTHPORT WAS THE GATEWAY OF MY LOVE FOR NORTHERN MICHIGAN." "HUNTING FOR BLUE STONES IN LELAND + SAVORING A NORTH SHORE SANDWICH—IT DOESN'T GET ANY BETTER!" Editorial & Advertising Offices 125 Park Street, Suite 155, Traverse City, MI 49684 Phone: 231.941.8174 Fax: 231.941.8391 E-mail: info@mynorth.com ©2019 Prism Publications, Inc. Ten play dates that will get you acquainted with this breathtaking county. Bliss out at Sleeping Bear Dunes National Lakeshore (see page 4). Climb to the top of the Grand Traverse Lighthouse. Bike the Heritage Trail from Empire to Maple City. Bike the Leelanau Trail from Suttons Bay to Traverse City. Hike the Clay Cliffs Nature Preserve. Browse the shops on the old wharf at Fishtown. Find yourself a DD or book a shuttle and taste wine on the Leelanau Peninsula Wine Trail. Play the slots at Leelanau Sands Casino. Play pioneer at Hillside Homestead in Suttons Bay. OUR ART. BURGERS, TOTS AND TALL TALES ...MADE TO ORDER. 90+ Award Winning Michigan Artists OPEN 7 days a week, May 10 - Oct. 31 Celebrating 20 years of wonderful art! EVENTS Leelanau County welcomes you with a roster of events that range from funky and hometown to hip and rocking. Check ’em out! Get the lay of this beautiful land at the Park's Visitors Center in Empire. It's just a hop and skip from the awe-inspiring view of Lake Michigan at the top of Empire Bluff Trail (1.5 miles roundtrip). Kids of all ages can’t resist the run down this gigantic heap of sand (the most popular attraction in the park). The climb up? That’s another thing. Trust us: the Glen Lake view from the top is worth the effort. Take a right where C109 ends several miles west of Glen Arbor and don’t stop until you hit golden sand and azure water. Between splashing and sunning check out the historic boats in the Cannery Boathouse Museum. Stroll north on the beach to the Sleeping Bear Point Coast Guard Station Maritime Museum. Pedal this asphalt ribbon over 20 miles through the heart of the park from Empire to Maple City. Pass the Dune Climb, Glen Haven beach, through Glen Arbor and by the Port Oneida Rural Historic District on the way. Unforgettable! The folks at Preserve Historic Sleeping Bear (M22 just south of Port Oneida Road) will set you up for a day of exploring the bucolic farmsteads of the Port Oneida Rural Historic District. Wind up this dreamy day with a hike to nearby Pyramid Point. If remote and rugged paired with sparkling sand and blue water as far as the eye can see appeals to you, book your ticket on a Manitou Island Transit ferry. Check out nps.gov/slbe for the deets. Hint: Don’t bring high heels. HAVE FREE WI-FI, KITCHENETTES, AND WEʼRE PET-FRIENDLY. HOPE TO SEE YOU SOON! The Women of sculptor Roberto Tirado Many new pieces in stock. Fishtown’s picturesque wharf, shanties and fishing boats beg for exploring and lingering. The wharf dates back to 1850s and the village’s first commercial fishing operations. In 1971, Bill Carlson, a descendant of one the oldest Leland fishing families, purchased Fishtown, retrofitting the shanties into galleries and shops. In 2007, Carlson sold Fishtown to the Fishtown Preservation Society, the entity that now manages it. Here’s a little trivia to get under the weathered old skin of this treasure. Catch a salmon on one of the fishing charters out of Fishtown. Get it smoked on the wharf at Carlson’s Fishery. Board the ferry to Manitou Islands here. Village Cheese Shanty’s North Shore was voted the #1 Best Sandwich in Traverse Magazine’s Red Hot Best Awards. The iconic tug the Janice Sue was dedicated in 1958 and has been working out of Fishtown ever since. What’s a Chubby Mary? Order one at The Cove restaurant and find out! The Leland River (once called the Carp River) is only .9 miles long. During the first half of the last century, Fishtown’s dam provided power for Leland, Suttons Bay and Northport. The safest way to paddle the passage is along Sleeping Bear Bay (rent kayaks and SUPs from Sleeping Bear Surf and Kayak in Empire), or by transporting your kayak on the Manitou Island Transit ferry and paddling the shoreline of the Manitou Islands. Novice kayakers will want to head out on an organized, guided tour with the National Park Service-authorized guides at All About Water—the service also rents and delivers kayaks and SUPs. Swim out from South Manitou Island to dive or snorkel the shallow-water wrecks the Morazan, the wooden steamer Walter L. Frost or the steam barge the Three Brothers. These and a boatload of other shipwrecks—many much deeper—are protected in the Manitou Passage Underwater Preserve. Scuba North in Traverse City offers guided trips to the preserve. The Manitou Transit’s evening Shoreline Cruise is a relaxing way to enjoy the Manitou Passage. A cash bar makes this the happiest of hours. Book a charter fishing trip with an experienced captain and come back with a full cooler. The passage teems with salmon and lake trout. Leave from Leland or Glen Arbor. - celery - lemon & lime - onion rings - buffalo chicken slider - beef slider - fried pickle ...pimento & blue cheese stuffed olives! Wash it down with a 6oz. side car draft or cider!! Available Sundays Only! Proudly dressing our friends and neighbors with the finest brands for over 140 years. Sip a glass of wine at one of this peninsula’s 26 wineries with their watery view and bucolic setting and you’ll see why USA Today readers voted the Leelanau Peninsula Wine Trail #3 in the entire country. But this American Viticultural Area (AVA) is more than just a beautiful face. Grapes thrive in this microclimate buffered from frosts and debilitating heat by Lake Michigan and inland lakes. The complex soil—a tapestry of clay, sand and glacial till—creates complex flavors that a handful of young, talented winemakers are turning into national and international award-winning wines. From the light, stone-fruit sweetness of a riesling to the elegant notes of a pinot noir, Leelanau’s wines are world class. The Leelanau Peninsula Wine Trail (the marketing organization for the wineries) makes it simple to plot your route by mapping the wineries out into three loops: Sleeping Bear, Northern and Grand Traverse Bay. The organization’s website, lpwines.com, keeps you abreast of all the many fun events happening in wine country from January’s Sips and Soups (soup and wine pairings at the wineries) to September’s Harvest Stompede, a run (or walk) through the vineyards. The website also has extensive information about chauffered tours (DDs being so important! ), weddings and other group events at the wineries. Where grapes flourish, so do apples. Leelanau’s orchards are as ancient as European settlement here—but no one was making commercial hard cider from them until Nikki and Dan Rothwell opened Tandem Ciders a decade ago. Since then, two more cideries, Suttons Bay Ciders and Two K Farms, have grown up on the peninsula and many of the wineries also produce cider. Think you’ve tasted Honeycrisps, Galas, Jonathons, McIntoshes and more? You haven’t until you’ve tasted them made into hard cider—and sipped them surrounded by apple orchards at one of these rustic cideries. There’s not a town on the Leelanau Peninsula that doesn’t have at least one Up North-style tavern sporting an array of taps and an ice-cold glass waiting for you. The past decade has seen the growth of hops farms dotting the peninsula—and to go with them, a handful of microwbreweries, most notably Hop Lot Brewing Co., in Suttons Bay where the majority of hops used in their beer is grown locally. The spirits produced at Northern Latitudes Distillery in Lake Leelanau are blessed with the essence of this beautiful peninsula. The 15 varieties that include vodkas, gins, rums, liqueurs and bourbon whiskey, are made with Leelanau water and Michigan-grown corn, malt, barley, sugar beets and Leelanau-grown cherries and saskatoon berries. The vibe of this establishment, founded and still owned by Mark and Mandy Moseler, is super fun and relaxed. You’ll also want to check out the Northern Michigan-based spirits at Grand Traverse Distillery’s intimate tasting room, with its old-timey bar ambiance, in Leland. The charming eatery serves made-from-scratch specialties with European accents, plus a full espresso bar and fine pastries. Bottles of Mawby bubble pop and froth for brunch mimosas. Embrace an a.m. spice kick with Pegtown’s hearty Southwestern Burrito stuffed with chorizo, scrambled eggs, peppers, onions, tomatoes and hot peppers. Go for a great cup of you know what, plus pancakes as you like ’em—oatmeal with dried cherries, fluffy buttermilk or blueberry. The Eggs Benedict are ones you write home about, and you can DIY to your heart’s delight in one of the most expansive and creative Bloody Mary bars this side of Lake Michigan. Start your day with Michigan-made kombucha and the chef’s adventurous masterpieces like the migas burrito, yak skillet, or braised pork jowl with poached duck egg and house-fermented hot sauce. Historic hangout with the a.m. standards plus Mexican standouts made with love, such as sunrise fajitas and huevos rancheros. (Breakfast Sundays only, 9 a.m. to noon) A full menu, or bring the crew and order an all-youcan-eat, family-style breakfast for the table: platters to pass with scrambled eggs, home fries, pancakes, bacon, sausage, ham, biscuits and homemade sausage gravy. Morning brews and beverages, too. Non-stop and one-stop flights to and from every corner of the U.S.
With a bounty of open land to roam, Leelanau County is dog heaven. Bring your pooch to marked beaches and trails in Sleeping Bear Dunes National Lakeshore including Good Harbor Beach, the Leelanau State Park and designated Leelanau Conservancy natural areas—areas that include forested trails, shoreline and gorgeous fields. And you'll enjoy your wine even more with your best friend at your side—many Leelanau wineries have pet areas. Wherever you go, please keep your dog leashed. #MyNorthPets We love to see your adventures. 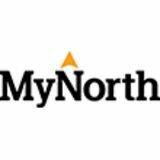 Follow and tag @MyNorthMedia on Instagram for a chance to be featured. Leelanau Style On this peninsula, there is a bed for every type of head. Beach cottages on golden swaths of Lake Michigan shoreline begging to be walked. Log cabins tucked in the woods. The Homestead, an amenity-filled resort with everything from hot tubs and pools to tennis courts. Mom ’n’ pop resorts on inland lakes where the fishing boat and the panfish are waiting. Rustic inns that creak with vintage memories. Homey bed and breakfasts where gourmet breakfasts await. Campsites within steps of rivers, lakes and Lake Michigan. Where do you want to wake up? Summer is coming. So are two spectacular new facilities at The Homestead. One is on Lake Michigan. The other, at the base of Bay Mountain. Both will offer unique new experiences certain to make “Remember when?” memories. BIKE THE LEELANAU TRAIL Leave the car behind and ride your bike from Traverse City to Suttons Bay—17 miles— along the paved Leelanau Trail. You’ll pass Grand Traverse Bay shoreline, orchards, farms, vineyards and more along the way. Take time for these fun stops! Graze at specially planted Edible Trails at the Cedar Creek Food Forest. Explore the DeYoung Natural Area with its protected shoreline on Cedar Lake. Grand Traverse Bike Tours can send you on a self-guided tour of the seven wineries along the Leelanau Trail. Stop for a photo op at the historic caboose at the trailhead on Cherry Bend Road. Reward yourself for all that pedaling at the Wares Bros Frosty Treat on SW Bay Shore Drive. With Sleeping Bear Bay and the Manitou Islands in its front yard, Sleeping Bear Dunes National Lakeshore on three sides and the Crystal River running through it, this nugget of a town on scenic M22 exudes natural beauty and adventure. The shops are superbly creative and dining runs from excellent tavern fare to fine. BEACH TIP: The Sleeping Bear Bay beaches at the ends of S. Lake Street and S. Manitou Blvd. 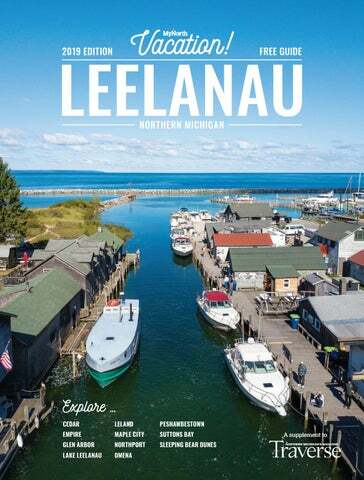 Tucked between a finger-shaped harbor on West Grand Traverse Bay and Leelanau Peninsula wine country, Suttons Bay rocks a hip vintage vibe with its brightly colored 19th-century storefronts that house an eclectic mix of shops and restaurants. BEACH TIP: Suttons Bay Village Marina a block off the downtown. Northport Bay unfurls like a bright blue flag at the base of this gateway to the tippy-top of the Leelanau Peninsula where the Grand Traverse Lighthouse, Leelanau State Park and Peterson Park make sightseeing an adventure. Find rocking shops and eateries in this buzzy small town. BEACH TIP: No need to carry your towel any farther than the downtown Bay Front Park on Northport Bay. This coastal hamlet shines from its turn-of-the-century neighborhoods and Main Street down to its harbor and weathered wharf and shanties of Fishtown. There’s no shortage of creative shops and great spots to eat. BEACH TIP: Van’s Beach behind Falling Waters Lodge. A sweet 19th-century downtown, funky shops and two great taverns put this gateway to the southern tier of Sleeping Bear Dunes National Lakeshore on the map. BEACH TIP: The Lake Michigan Beach Park just off the downtown is a summer day’s dream. A postage-sized town perched on half-moon Omena Bay with an old timey general store, a waterside bar and a waterside winery. BEACH TIP: Dip into the crescent moon-shaped Omena Bay located in the village. Located in the heart of the peninsula at the picturesque Narrows channel, you are never more than a few steps from delights and discoveries— whether on a boat ride, at a winery, in a legendary bar, at an artisan bakery or a bustling grocery with prime picnic provisions. The waterside home to the Grand Traverse band of Ottawa and Chippewa Indians, Leelanau Sands Casino and Eyaawing Museum. Duck your head as you ascend, and look up for magnificent views of Lake Michigan and Grand Traverse Bay. The Grand Traverse Lighthouse, on the grounds of the state park, has been guiding ships and sailors since the mid-1800s. The shores at the state park campground—home to 52 rustic sites—are perfectly pebbly for rock hounds. Five miles south at Cathead Bay they’re sugar soft for sandcastle building and swimming. In the fog signal building on the lighthouse grounds, find an interactive program and learn more about how professionals use Remote Operated Underwater Vehicles to explore the Great Lakes. Did Ya Know? There are at least 14 known shipwrecks between Northport Bay and Cathead Point—six or seven have been found. An excellent trail network forms almost six miles of loops through this peaceful region of the park. The trailhead and parking lot is at the end of Densmore Road. Leelanau Peninsula Wine Trail Explore the Midwest’s largest wine trail where you’ll find 27 wine destinations, each known for its unique character and ambiance. take m-204 west of the village of lake leelanau, 1 mile. turn left on s. french rd-tasting room is located 3 miles south on the right. True love in a bottle of wine ... sealed with a sip. Enjoy our estate grown and award winning wines.